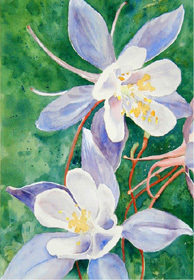 We hope you enjoy looking through the various galleries of Gail's paintings. Click on "Gallery Portal" to access each category. Other galleries may be accessed from any page, while cards and prints are available and may be purchased by clicking on the "buy now" link. We welcome your comments and invite you to sign our guest book. Thanks for visiting! We hope you enjoy the artwork. If you would like to add a link to Gail's website to your website, click on the link below. If you like, we can add a link to your site here as well. The science of SEEING nature, people, and landscapes in a way that literally brings them to life upon paper. We hope you enjoy this site! "The picture was really something unique... My mom absolutely loved it!" captured their personalities to a tee. Thanks for putting such heart into it." Are you interested in having a painting done of a person, pet, or a scene you love? If so, you've come to the right place. Please allow me to help you have the painting you desire.